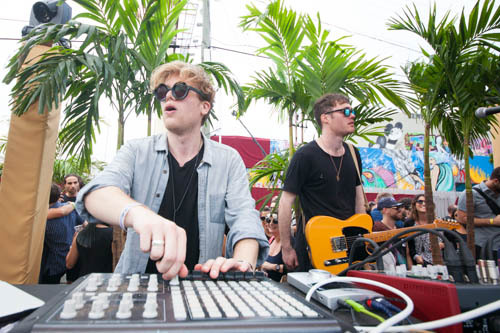 This DJ Mag reporter set a personal Miami record last night. In bed by midnight and a whopping 10 hours sleep. Still, he isn’t getting any younger and today’s schedule is jammed. A perfectly seasoned chicken, red pepper and avocado sandwich poolside is washed down gratefully with a cold beer while we edit, type away and send rapid-fire emails organising various interviews and shoots with DJs tomorrow. Really, though, our mind is elsewhere. Damian Lazarus’ Get Lost, originally named Ket Lost (we wonder why), is back with another 24-hour party following last year's marathon at Ice Palace. 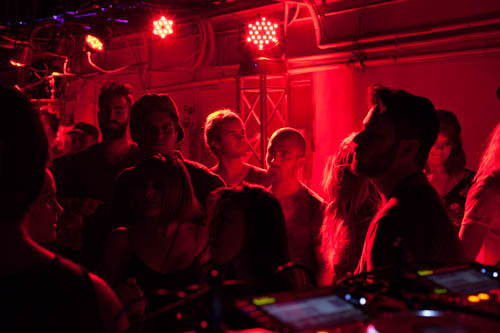 This time it's at LMNT Studios, a series of indoor and outdoor spaces downtown dressed up with all the weird wizardry expected of the Crosstown Rebels boss’ after, after, after party, celebrating its tenth year. 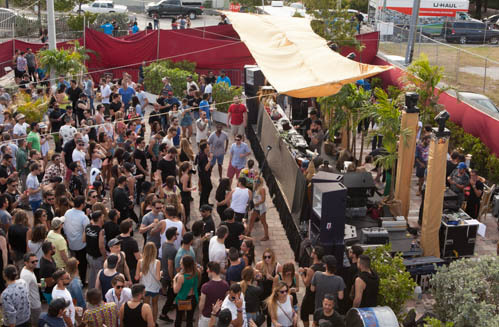 As always, it’s a who’s who of top-end underground house and techno stars. We enter a massive car park, where the sun is still high and Fur Coat are spotted on the stage dropping Daniel Bortz’s guttural pitch-black banger ‘Steady Note’. We exchange a quick high five with Claude VonStroke before heading down a graffitied side street where we spot Damian behind the booth dressed a bit like a cross between Merlin and Ming The Merciless. 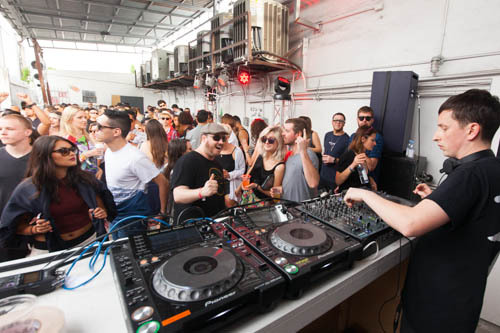 Sub-ann, Kate Simko, the Rebel Butterfly crew and Love Fever’s Sheriff are just some of the industry folk kicking about, but the main attraction is TEED, who’s holding court on the decks (minus the head dress) with Steve Lawler’s 909 work-out on Hot Creations, ‘House Record’. It’s about 4pm and the vibe is shades-on and smiley, some here — who arrived almost 12 hours ago, when doors opened at 5am — are already looking a little wonky. Hanging above their heads is a tree of keys (a tree-key) and the place is in every sense bumping. A passage through a dark, squat-like space and a booming backroom thick with dry ice, we struggle to see more than a foot in front of us until we discover whole other area out back; a large halcyon garden where Canadian duo Bob Moses are delivering their soporific, sepia soul live on MPC, mic and electric guitar. ‘All I Want’ and ‘Hands To Hold’ sound particularly anthemic, their pulsating 4/4s bigger than ever on the meaty Funktion One rig. Meanwhile, Sneak and Farina are rocking the alley, where the chunky, hypnotic sound of Justin Faust’s ’Spellbound’ has more than a few fists pumping. Next up, Ellen Allien is having some trouble with a sketchily wired soundsystem before it cuts out, not once but twice. Despite this, her tune selection is spot on — dreamy Berlin techno crossing oddball house grooves — but it’s a set she’ll happily forget. With night upon us, we jump in a cab back to the hotel for a quick pit stop before heading to Collins Ave, where the DJ Mag Allstars share some underground sounds with Shore Club’s swanky Red Room before Tommie Sunshine (aka "The Dude" of The Big Lebowski?) takes it “big room”. Finding an EDM remix of ‘Pump Up The Jam’ a bit too abrasive for our tired little ears, we decide to hit Harvey and Dixon at Red Bull Guest House, a few blocks down, but don’t last long until needing to crash out. Day four nailed!